Good and evil, dirty and clean, modern settings juxtaposed with ancient imagery. These are all themes that Claire Barrow raises in her upcoming exhibition The Bed, the Bath & the Beyond, opening on April 17 at M Goldstein Gallery in Hackney, London, with all works for sale. Perhaps best known previously for her work at London Fashion Week, which blurred the lines between art and fashion, Barrow has always maintained a balance as an artist and designer. In her first solo art show, Barrow decorates a new range of “canvases” with her signature neo-primitive style, from toilet roll to shower curtains and neon lighting on Perspex. Taking the most private and intimate moments of our day and the spaces where we typically don’t interact with others, Barrow infuses them with the occult, demons and ghouls. 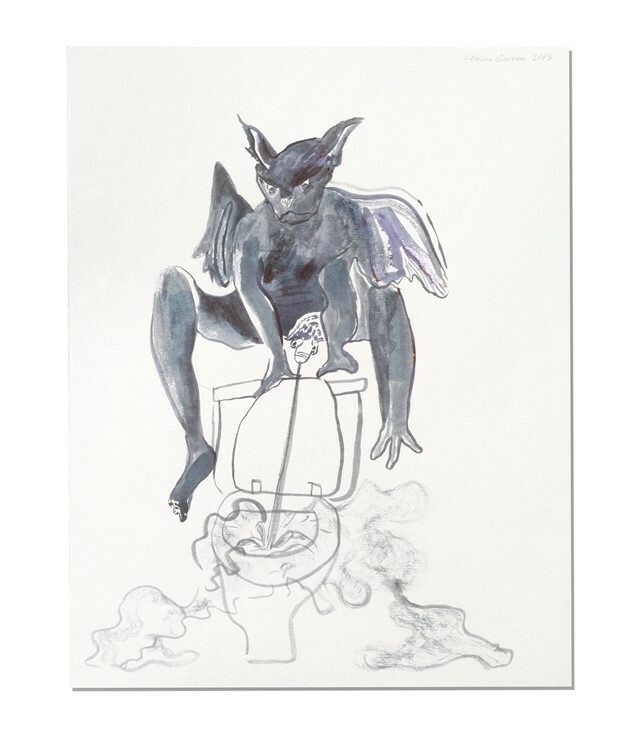 Ideas surrounding the modern trend of trying to “cleanse” ourselves superficially through everyday rituals like showering or popping meds, while inside the spiritual taint lives on (embodied, for instance, by a devil lurking on the back of a toilet cistern) are raised by Barrow in this statement show. Below, we spoke to the London-based artist and designer ahead of this week’s opening to find out more. What was the inspiration for the theme of cleanliness next to godliness? Claire Barrow: It’s a saying that applies to modern life and to our anxieties about being accepted and fitting in socially, about being vain and narcissistic. Can you tell us about the title, The Bed, the Bath & the Beyond? Claire Barrow: It’s the name of an American store, I’ve just added in ‘the’. It relates to consumerism – using a well-known chain. But the title has a spiritual meaning too, about being the best version of yourself. Science has proven that it’s hard to have faith in anything other than your own self and your own well-being. The work itself I saw as quite clinical, I went over it a lot, repainting. I considered it throughout the process, the layers. The packaging references relate back to taking tablets or taking drugs to heal or baptise yourself or to fix your mental health. How does it feel to have your first solo art show? Claire Barrow: Nathaniel (gallerist at M Goldstein Gallery) actually made this happen. I had briefly thought about doing an art show, but finding the time was hard with my fashion schedule, so it happened at the right time. Finding the time to take out of the collections was hard, but he asked me far enough in advance to work it out. I’ve brought up the idea that I’m an artist in my work before, but it’s different with the work you make on clothes. You make them, then they get worn by models, they get washed, you take them off, put them away, you become detached. With art it’s more confrontational, it’s there on the wall, it becomes part of your life and your surroundings. Fashion and art seem to be incredibly intertwined for you and your work, often playing into one another. What differentiates each and the way you work within both realms? Claire Barrow: The difference is that there’s a team around me in the fashion – with people wearing it, it becomes a different version of my initial idea. When I’m making art, it’s just me on my own in my studio looking at one piece. There’s a big difference when I’m working on fashion; I’m working on my computer a lot, editing files, getting artworks ready for printing, cleaning them up, preparing them – this takes up a lot of my time. As well as sketching out the designs for the collection and for each piece, in theory, it’s a lot more work. What’s really good about this show is that I’ve had lots of time to think about each piece and make it, that’s something I’d like to sort out for my fashion stuff, how important it is to have the time to consider the work. Art is less forgiving, I feel – you are just confronted with the piece without other distractions of models, make-up, hair, surroundings and the photography. 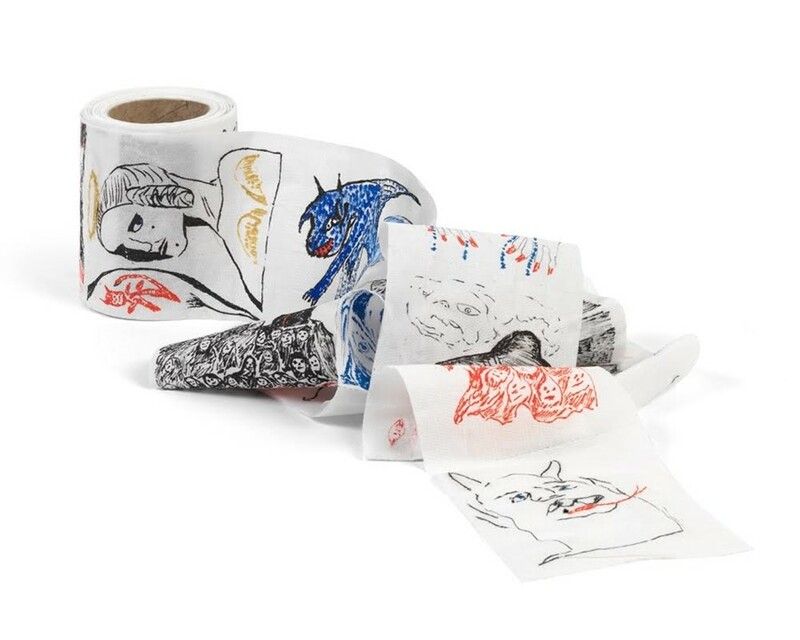 Your artwork ranges from marker pen on toilet roll through to more classic styles like ink on paper. How important is that freedom to experiment? Claire Barrow: It’s very important for me at this stage because I don’t like repetition in my work. That’s very much my ethos. That’s one of the things that draws me to fashion – I like to explore different themes each season.